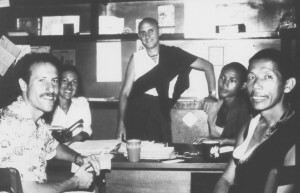 Karuna Cayton, Pam Cayton, Nick Ribush, Thubten Tsering and Lama Lhundrup in the office at Kopan circa 1981. Photo courtesy of Karuna Cayton. Karuna Cayton spent 1975-88 mostly living and working at Kopan Monastery. He wrote the following reflection on his experiences with Lama Lhundrup in early August 2011. I first noticed Lama Lhundrup shortly after I arrived at Kopan in 1975. In the early mornings, as the young monks swept the courtyard and the gompa steps, I would see a short lama, zen covering his head, barely visible in the doorway leading upstairs, watching with a quiet and detached gaze. Lama Lhundrup was a reluctant superior at first; he would often tell me that he would have preferred to study for his Geshe degree in Sera than supervise a small, struggling monastery. He would comment that he had no qualifications to be managing a monastery full of future geshes. And yet, as he put it, Lama Yeshe had asked him to come and so he had no choice. For most of 14 years, from 1975 to 1988, I, along with my wife Pam, worked side by side with Lama Lhundrup. Of course there were many other important figures in the early developments of Kopan such as Lama Pasang, Gelek Gyatso, Tenpa Choden and a host of volunteers. But it was Lama Lhundrup who was always there. He was the glue that held Lama Yeshe’s vision together, both before and after Lama Yeshe passed away in 1984. Lama Lhundrup was both the mother and father to the Kopan monks as well as the Western visitors. While we grieved during Lama Lhundrup’s recent illness, Lama Zopa Rinpoche stated, “You don’t need to worry about Lama Lhundrup because he spent his life fulfilling Lama Yeshe’s wishes.” I think this quality of Lama Lhundrup’s is just one of the qualities that make him so remarkable. Lama Thubten Yeshe was a visionary Lama, a rebel of sorts, a renaissance man. In traditional Tibetan society, particularly the society of monastics, innovation was viewed suspiciously. And yet, Lama Yeshe saw the writing on the wall for the exiled Tibetans and Himalayan Buddhists and while his ideas might have seemed radical, Lama Lhundrup, from my experience, never faltered in attempting to fulfill Lama Yeshe’s dreams. Lama Lhundrup knew Lama Yeshe’s extraordinary attributes and thus attempted to carry out Lama’s ideas, often upon faith alone. Kopan in those days was not well off. It was quite poor and the food was pretty substandard for the monks. I remember when we would be nearing the end of monsoon season, essentially the end of the fiscal year, and running out of money. Lama Yeshe would usually be out of Nepal and lacking internet, telephones, wire transfers and credit cards, we were left to our own devices to have ample food before Lama returned in the autumn. Lama Yeshe insisted that if we did not have enough food then we should grow it. Like a skillful father, Lama Yeshe was helping us mature and stand on our own feet. And in Lama Lhundrup, Lama Yeshe had a trusting, dutiful “son.” After a while we had plenty of vegetables that Lama Lhundrup made sure were grown in order to avoid the shortages we experienced the previous year. Lama Yeshe wanted Kopan to be self-sufficient and presented various money making or money saving ideas. Many of his ideas were unusual for a traditional monastery: producing ginger beer (non-alcoholic), flowers and ginseng, to sell in the local market. He was concerned about the monks’ health and he initiated an exercise regime. He felt English, math and social studies would be essential for the new monastic order to survive. All of these new ideas, and many more, he put on Lama Lhundrup’s shoulders and Lama Lhundrup never argued or got in the way of Lama Yeshe’s vision. In fact, Lama Lhundrup was the key to the fulfillment of Lama’s vision for Kopan. Lama Lhundrup felt responsible for every wish Lama Yeshe and Lama Zopa Rinpoche had for Kopan. When Lama Lhundrup felt he had let Lama Yeshe down he would have the same look on his face that a mother has when not being able to provide her child with safety and nurture. Sometimes Lama Yeshe was stern with us when we were falling short of his expectations. At those times, Lama Lhundrup would have a look on his face that seemed he was saddened by having failed his lama. But, at the same time, after being reprimanded by Lama Yeshe, while I would be upset, often stunned and speechless, when Lama Yeshe would walk away, Lama Lhundrup would turn to me and softly giggle. He knew Lama’s love. Lama Lhundrup knew he was doing his best. He knew we would get better and we would fulfill all of Lama Yeshe’s wishes. Lama Lhundrup understood Lama Yeshe’s extraordinary qualities and was never fooled by the mere manifestations Lama Yeshe would use to guide living beings. You see, Lama Lhundrup has a quality of mind that comes from years of true practice. Another one of my tasks, given to me by Lama Yeshe, was to establish a Western studies program for the monks. As part of my responsibilities I was expected to maintain discipline of the monks at the same level as the other monastic teachers. If I was viewed as too soft or gentle I would be run over by the young monks who, I used to joke, “could eat rocks for breakfast and walk barefoot in snow.” So, Lama Yeshe advised me to look tough, carry a big stick, that sort of thing. Once when I confessed to Lama Lhundrup, whom I never saw lose his cool or get angry, that I was having a tough time with Lama Yeshe’s advice to me, Lama Lhundrup advised me: “First, you can never discipline any monk if you are angry. And second, you can only use force on them with your mind.” While the monks were truly intimidated by Lama Yeshe’s mere presence, they would giggle when Lama Lhundrup tried to put on a stern face and discipline them. They knew he was just acting to be tough and his vain attempts at being strict were seen as just a cover for the mother’s love he demonstrated for them all. I refer to Lama Lhundrup as my “friend.” I do not mean this in an arrogant or derogatory way. He is my kalyanamitra, my spiritual friend. If you know Lama Lhundrup, then I believe you know what I mean and you see him as your friend also. It is amazing the impact Kopan has had on thousands of lives throughout the world. I believe it is accurate to say that without Kopan there would be no FPMT centers. And without centers, many may have never met Lama Zopa Rinpoche, Lama Yeshe or the Dharma path. Without Lama Lhundrup, perhaps there would be no Kopan. We owe much to our old friend. Karuna Cayton currently serves on the FPMT Board of Directors.